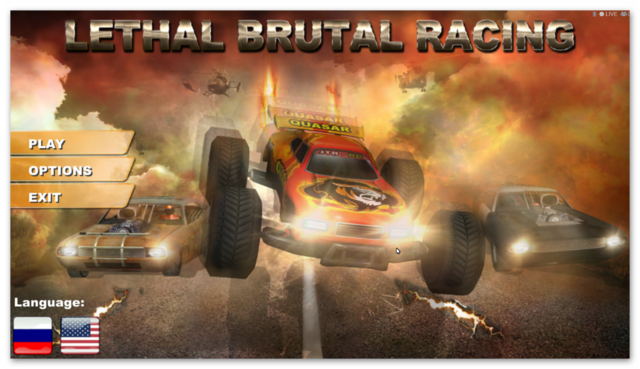 Lethal Brutal Racing was available as a giveaway on January 28, 2019! Was able to (mostly) work around the steering problem using JoyToKey to map keyboard to joystick ("mostly" meaning I still had to tilt the joystick up to accelerate, even though I assigned a button to do it, but it worked at times only, maybe bc this version of JoyToKey remembers XP and isn't too fond of 10). Anyway, I love racing games, but don't like them mixed with anything else. I have a few FPS, but I prefer pure racing games w/o shooting. The colorful graphics is the only real positive. Physics is... a joke? You cannot crash out of the track, but you can drive through your opponents or slam into the barrier w/o any noticeable damage. The lack of attention to detail is also visible in misspelled names of weapons ("plasme thrower" or "messile launcher"). For those who like this kind of games it may be entertaining if they figure out its kinks, I will stick with racing only. But it's good to see some kind of a racing game here after such a long time. 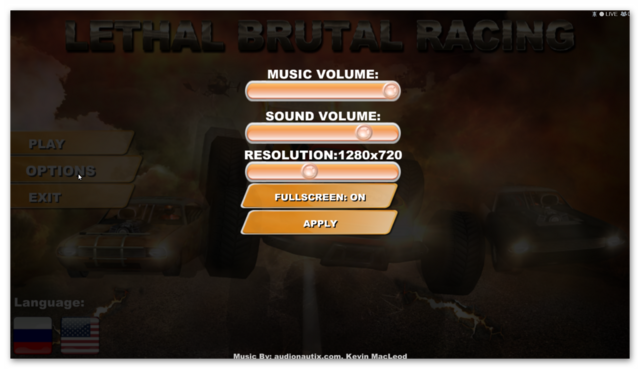 Lethal Brutal Racing downloads to a 77.1 MB zip file that unzips to three files, (a setup.gcd security wrapper the set-up file and a read me). The game installs to the following path by default, but can be changed if you wish. The installed game is 384 MB in size. Five shortcuts are installed to the desktop, four of which can be safely deleted (i.e. Falco Space - Online Game!, FalconLine Online Games Website, FalcoGo WebGL Games! and Free Games Downloads!). If you don't want to install the games shortcut to the desktop during installation, just make sure the install desktop shortcut is unchecked when the 'additional task's window appears; you will still get two of the other Falcoware shortcuts installed (i.e. FalconLine Online Games Website & FalcoGo WebGL Games shortcuts). Also, if you don't like icons installed to the quick launch task bar, make sure you also uncheck the appropriate checkbox when the 'additional task's window appears (after the Select Start Menu Folder window). To start racing you have to select your first car to race with. 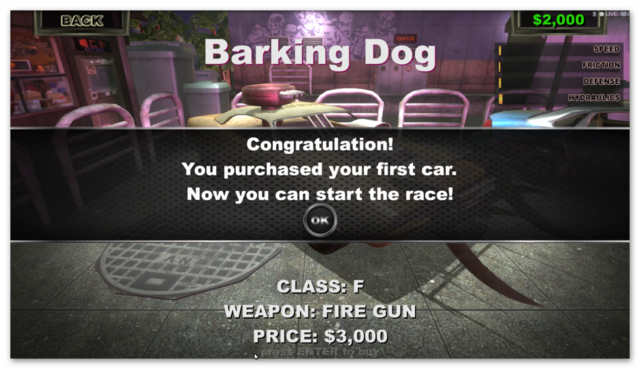 The $5000 you are provided with is only enough to purchase the cheapest and weakest of the six available cars and is called the 'Barking Dog'' that costs $3000. 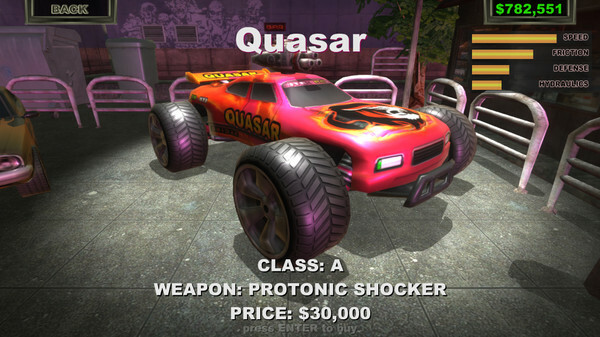 Each of the six cars have a specific name; for example, Road Judge a $6000 police car with a plasma thrower, the Acid Bandit costing $120000 and includes a laser, the Inferno costing $20 000 that includes a missile launcher and the Quasar costing $30000 and includes a psionic shocker. 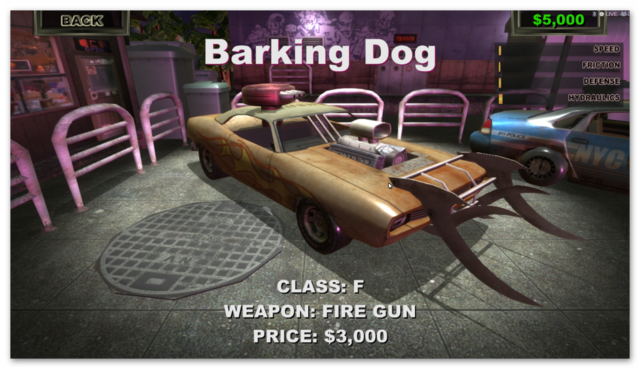 The $2000 you have left after purchasing your Barking Dog can be used to upgrade your car or weapon. With $2000 you can upgrade with at least one of the five car upgrades that include the engine, armour, shock absorbers or tires plus the weapon. 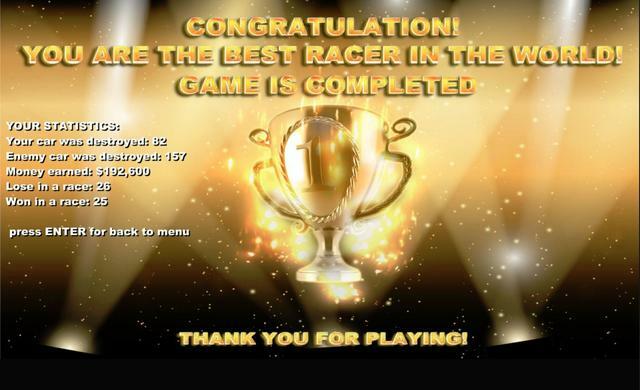 As you race you are awarded prize money, the better your race result, the more cash you can earn. 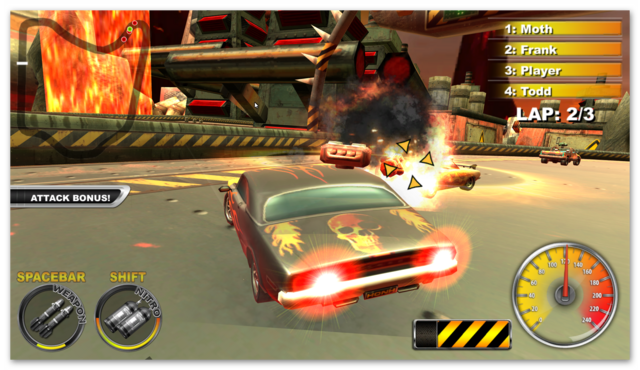 Of all the games of this type that I've played over the years that include destructible and/or weaponized vehicles, e.g. Darkwind: War on Wheels, Flatout 1 to 4, Crashday, Carmageddon, Gas Guzzlers, Hard Truck: Apocalypse, Split Second, Wreckfest (originally called That Car Game), and lots of others, This has to be the least enjoyable I've played. The controls cannot be remapped, and there is no controller option, plus the physics don't feel right. Drifting is possible, but not very effective, (when I tried to drift, I invariably crashed into the barriers). 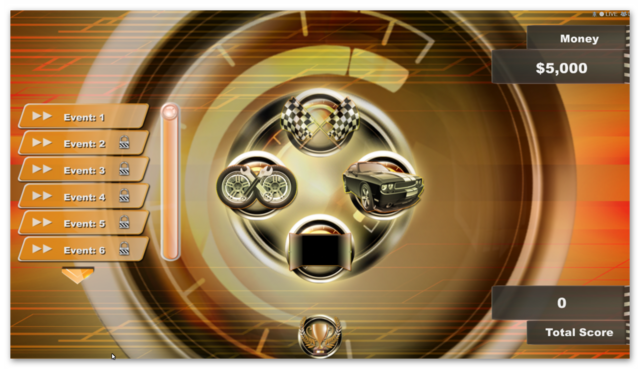 Control options include either the WASD or arrow keys for acceleration, braking and turning left or right. To use your weapon press the space bar and for nitro the shift key. There doesn't appear to be extra ammo, nitro or health pick ups while you race, so you need to keep an eye on the indicator to the left of the race track that shows you via a bar how much ammo you have left. As you upgrade ammo and nitro the bar is increased, giving you more of each. Once used up, you don't get any more until you are destroyed by your opponents or blown up by the barrels of fuel that you may crash into occasionally. It is possible to avoid these, but because control isn't spot on, I lost my car several times, just by crashing into those barrels regularly. 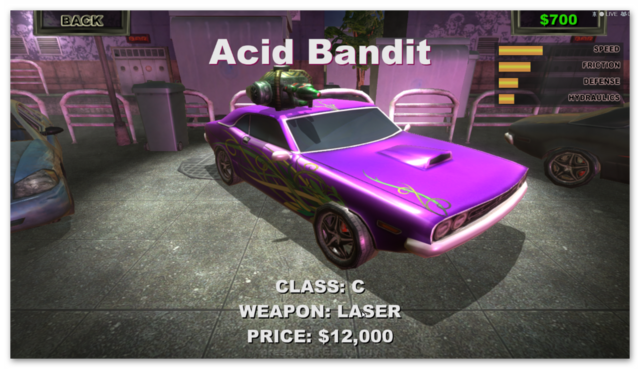 It takes a few hits with the weakest car before it is destroyed by either those barrels or from hits by other opponents. I found it useful not to use the ammo until the last lap and preferably near the end of the race. 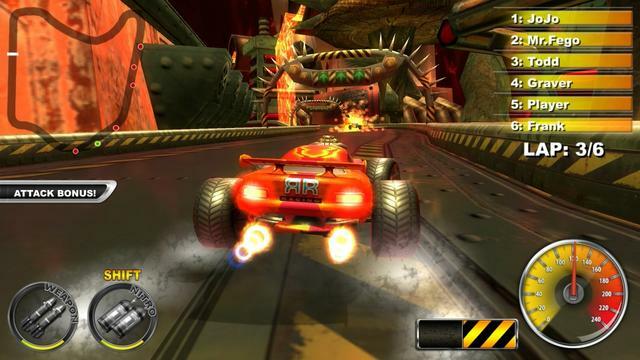 The nitro button gives you an extra speed burst, which is useful on the straights, but will inevitably lead to you crashing into the barriers if you try to use it on a bend and is therefore wasted. 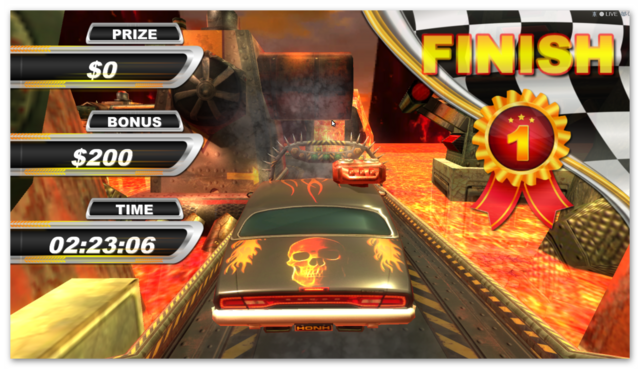 Trying to take a racing line is almost impossible and when navigating around bends it almost feels like you are going in slow motion, and unless you are very careful, you'll end up crashing into the barriers even without using nitro. 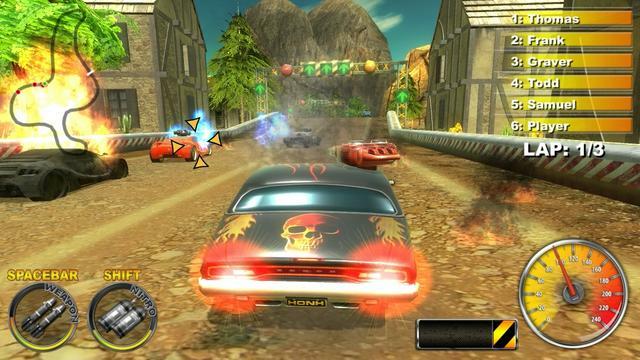 That said, it's a colorful racing game that despite its negatives, once you get used to the controls can give some pleasure. 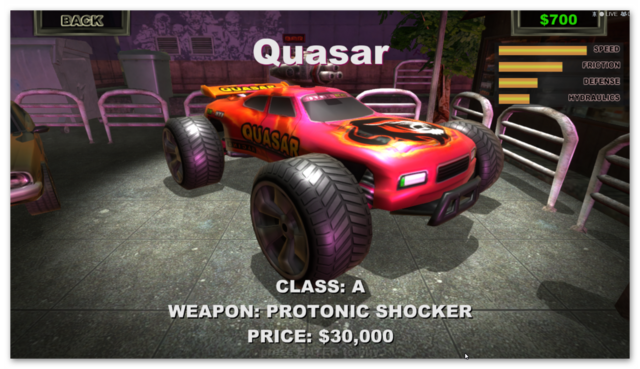 Winning races gives you extra cash to upgrade your vehicle and once you have enough you can upgrade your car to a better and more efficient car, ranging from the Road Judge a police car with a plasma thrower costing $6000, or the top of the range Quasar that includes a protonic shocker (I haven't a clue what that is) and costs $30000. In all you have five cars to choose from (not counting the first car you have to purchase). 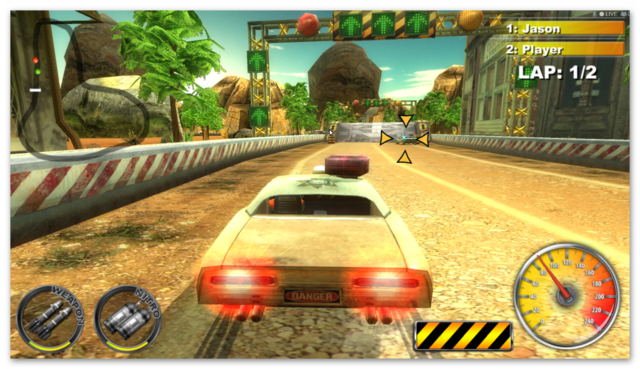 To scroll through the vehicle selection screen use the left and right arrow keys. 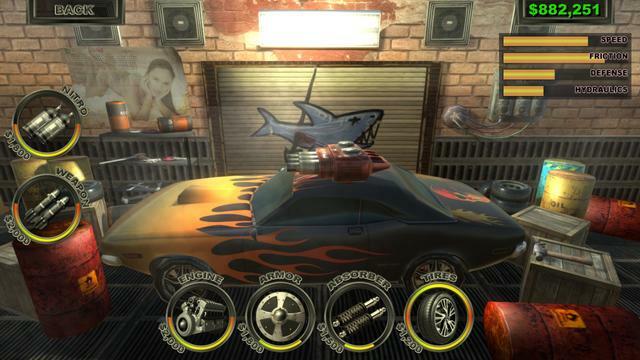 To the top left you'll see the attributes the car has. There's no numerical data, just a bar graph, showing the vehicles top speed, and handling with respect to hydraulics and friction (i.e. shocks and tires). 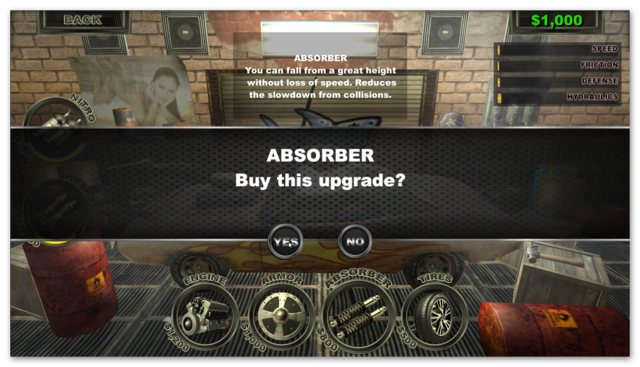 As you progress to better vehicles, the costs of upgrades increases as well. There are 25 races to complete; all but the first are locked. To unlock the next race you need to win the previous race; coming second or third (as is the case with other game sof this type) does not unlock the next level, it has to be first place. That said, it's not that difficult to get first place. I easily beat the first three levels on the first go, but it took me three goes to win level 4. I've not progressed further yet, but do intend to continue in small doses later. :). 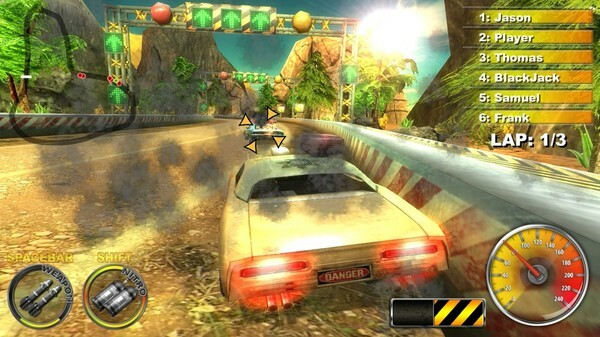 Definitely not my favorite vehicle based racing game with guns. I've played a lot of these over the years and found too many limitations with this game, the controls, the lack of pick ups to recharge your ammo are just a couple of the issues i had with this game. 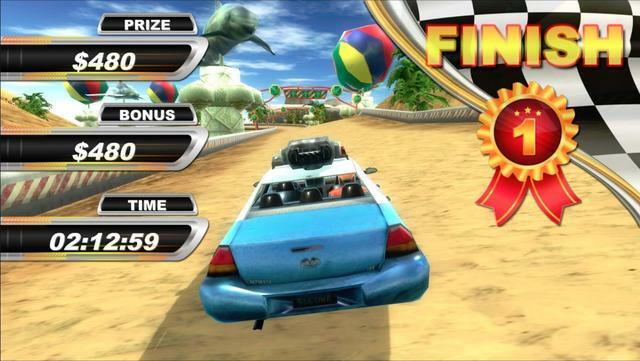 It is playable, and you can win races fairly easily. If you've never played a vehicular combat game before (and I'm not talking games like Battlefield with tanks etc) then this is worth checking out. If you've played any of the games I mentioned in the review above, then I'd probably say no to this game. You can see several in-game videos of game play (warning some of the videos do include swearing) HERE, HERE, HERE, HERE, HERE (swearing), HERE & HERE. If you're having problems installing or activating or getting Lethal Brutal Racing to work please visit the FAQ's Thread HERE and read through the communities comments because sometimes fixes have already been posted, for example, a common issue seen since the Themida wrapper was introduced three years ago is that some community members installation of the game are blocked by their security because Themida code has been known to hide malware, (usually an error message is flagged for example 'The executable is corrupted' even though in reality it is not); so as a precaution some anti malware programs will block and even delete the suspect installation files even though the files (i.e. the setup, read me and setup.gcd files are actually totally free from malware. This issue can be solved either by rebooting your computer in safe mode with networking or a quicker method is to temporarily turn off your security software to allow the installation. You could also try whitelisting the setup.gcd file. In the almost 12 years this game giveaway site has been operating there has 'never' been a game given away that was infected with malware. 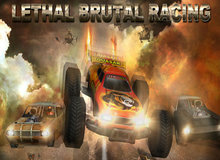 If Lethal Brutal Racing doesn't interest you, but you still hanker for something new to play, you'll find details of some game deals whether they be sale items, indie bundles or games being given away for free HERE (I've not updated the thread in a while, but most of the links still take you to the latest deals).